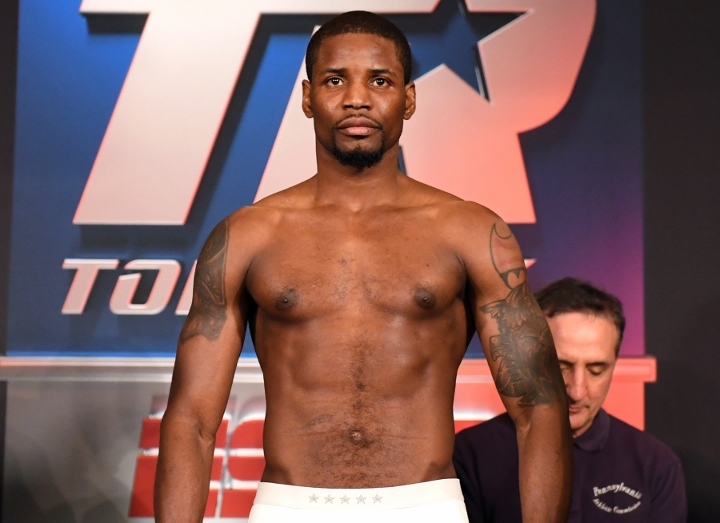 Ghana’s Fredrick Lawson got shocked and stopped by Mexico’s Juan Ruiz who pulled off the upset in the fourth round of a scheduled 10-round junior middleweight match, yesterday. Ruiz’s chopping right hand to the side of Lawson’s head hurt Lawson badly with just over two minutes to go in the fourth round. When Lawson crashed to the canvas, Rosato ruled that it was the result of Ruiz pushing him. Lawson clearly was hurt, though, and could only attempt to cover up once the action resumed. Ruiz knew how hurt he was and unloaded a flurry of power punches on his disoriented opponent. Rosato wisely stepped in to halt their contest at 1:16 of the fourth round. Chicago-based Lawson, 29, fought for the first time in 11 months. Lawson, a native of Ghana, lost for the first time since suffering a broken jaw during a technical-knockout loss to Kevin Bizier in November 2015. Last Saturday night, middleweight prospect Christian Mbilli went the distance for the first time since he turned pro following the 2016 Summer Olympics. Mexican veteran Humberto Gutierrez took a beating to the head and body, but he lasted all eight rounds against the hard-hitting Mbilli. The 23-year-old Mbilli basically beat up Gutierrez throughout their eight-rounder, so soundly that judges John McKaie (80-72), Ron McNair (79-73) and Kevin Morgan (79-73) scored their fight for Mbilli by big margins. The Cameroonian-born, Montreal-based Mbilli moved his record to 14-0 (13 KOs). Gutierrez, 30, has been knocked out just once in 43 professional fights (33-8-2, 22 KOs). Following Ruiz’s upset victory, super featherweight prospect Joshafat Ortiz remained unbeaten by knocking out James Thomas in the first round of a scheduled six-rounder. A left hook by Ortiz landed to the side of Thomas’ head and sent him to the canvas, flat on his back, toward the end of the first round. Sensing Thomas was in no condition to continue, referee Eric Dali stopped their fight at 2:53 of the first round. The 23-year-old Ortiz, of nearby Reading, Pennsylvania, upped his record to 6-0 and scored his fourth knockout. The 34-year-old Thomas, of Grand Rapids, Michigan, has lost three straight fights (6-5, 6 KOs).